/ Best Calzone in Destin FL / SUNNY FREEDOM FRIDAY! 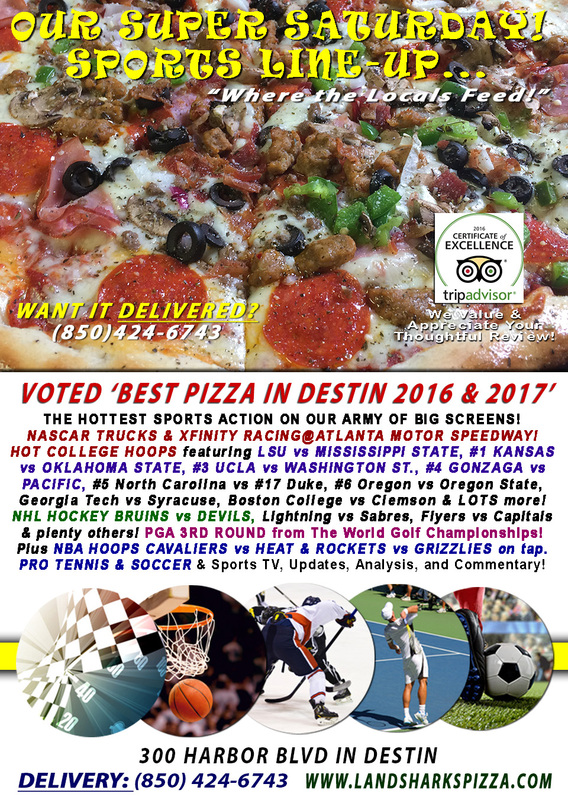 PGA, NCAA, NHL, NBA & More to Go With a 2-Topping Mega Mini-Calzone just $6.99! SUNNY FREEDOM FRIDAY! 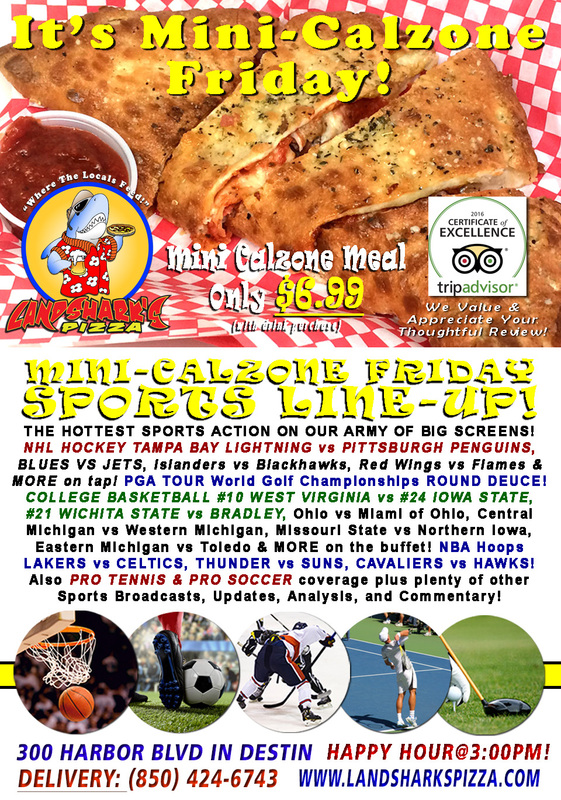 PGA, NCAA, NHL, NBA & More to Go With a 2-Topping Mega Mini-Calzone just $6.99! The weekend has arrived in Destin – time for a Delicious, Brick Oven-Fired Landshark’s Calzone with not just one but TWO choice toppings, dine-in til 5pm only $6.99 – BELLY BUSTER of a deal! 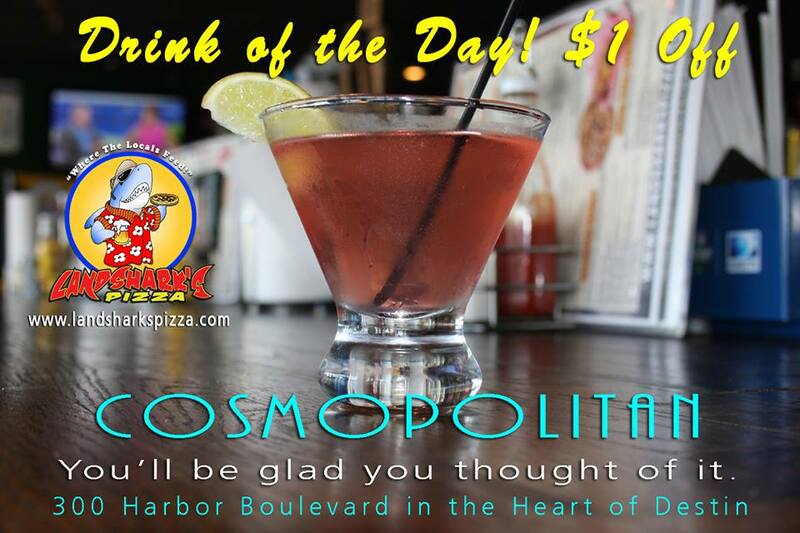 THE LANDSHARK’S DRINK OF THE DAY – $1 OFF our Landshark’s ‘COSMOPOLITAN’! SPORTS ON OUR ARMY OF BIG SCREENS – NHL HOCKEY action with TAMPA BAY LIGHTNING vs PITTSBURGH PENGUINS, BLUES VS JETS, Islanders vs Blackhawks, Red Wings vs Flames, Maple Leafs vs Ducks on tap! PGA TOUR World Golf Championships ROUND DEUCE! NBA HOOPS LAKERS vs CELTICS, THUNDER vs SUNS, CAVALIERS vs HAWKS, Spurs vs Pelicans, Knicks vs 76ers & MORE! COLLEGE BASKETBALL with #10 WEST VIRGINIA vs #24 IOWA STATE, #21 WICHITA STATE vs BRADLEY, Ohio vs Miami (OH), Central Michigan vs Western Michigan, Missouri State vs Northern Iowa, Eastern Michigan vs Toledo, Ball State vs Northern Illinois & MORE on the buffet! Also PRO TENNIS & PRO SOCCER coverage plus plenty of other Sports Broadcasts, Sporting News, Analysis, and Commentary! Pro Golf This Week: World Golf Championships-Mexico Championship, Adam Scott defending his title. 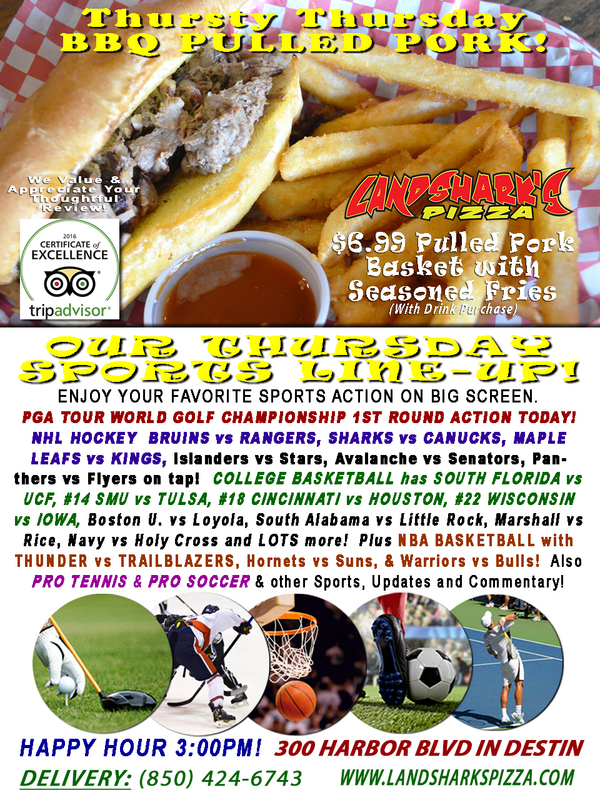 Previous Post: « Thursday AWARD-WINNING BBQ@ Landshark’s in Destin – PGA World Golf Championship, NCAA, NHL & NBA & MORE!